We manufacture all types of BOPP Slitter Rewinder Machine.We have been successfully, Exporting & Supplying all types of BOPP Tape Slitting Rewinding Machine. 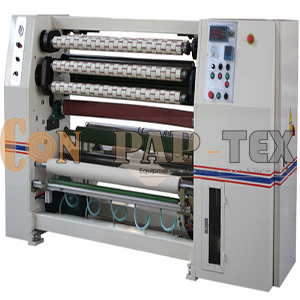 CPT Offer various types of BOPP Slitter Rewinder Machine which can be used for BOPP (Duct & Mask) Tapes. BOPP Slitter Rewinder Machine also known as BOPP Tape Cutting Machine working width 300 mm suitable to slit Adhesive Tape from 12mm onwards. We are winner of 3 times National Award and 2 times International Award for Quality manufacturing. BOPP Tape Cutting Machine. BOPP Tape Slitting Machine is one of the leading Manufacturer, Exporter and Supplier of BOPP slitting machine, bopp cutting machine, Bopp Tape Making Machine. Also, BOPP Tape Slitting Machine, BOPP Coating, BOPP Jumbo Slitting, BOPP Tape Slicer. High quality BOPP Tape Making Plant, BOPP Tape Making Machine, bopp slitting machine, bopp cutting machine and 1000 mm Working Width BOPP Coating Machine Plant Complete in all respects with Two Web Aligner Units, Heaters, Blower, Motor with Panel and all accessories as per Technical Specification Annexure Enclosed herewith.